Filepicker.io helps mobile and web application developers directly integrate with the user’s files in multiple cloud storage platforms. We save developers time because they don’t have to write custom code for file upload and file management. tl;dr: When doing customer development it’s valuable to focus on the non-work related persona of the customer. All perfectly valid customer development questions. Steve Blank would agree. But, a couple of days ago a twitter exchange surfaced on our feed that caused me to see things in new light. 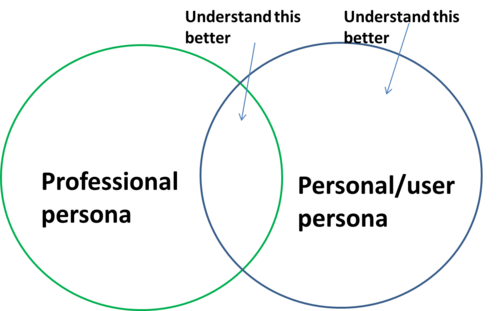 At the end of the exchange, I realized I had developed a blind spot in understanding the broader customer context. Customers were using us in ways that we had least anticipated. Disclaimer: The screen shot below is of a public twitter exchange but i have intentionally obscured details for added privacy reasons. Urls are used by developers for call-backs and other processing operations. Well, at least this is how we expect it to be used. But as the twitter exchange shows, here is a situation where a user directly used the Filepicker.io url to send a screenshot to his colleagues/friends. We hadn’t expected this to happen. We tried to figure out how he had done it. You can generate sample urls in the docs page on our website that you can share with others. But that’s not what happened. It turns out that the user was a developer and had used the CLI tool in the community which allows you to get a public link for any file! This interaction helped me realize that this was an interesting situation of the developer’s professional persona intersecting with his personal/user persona. 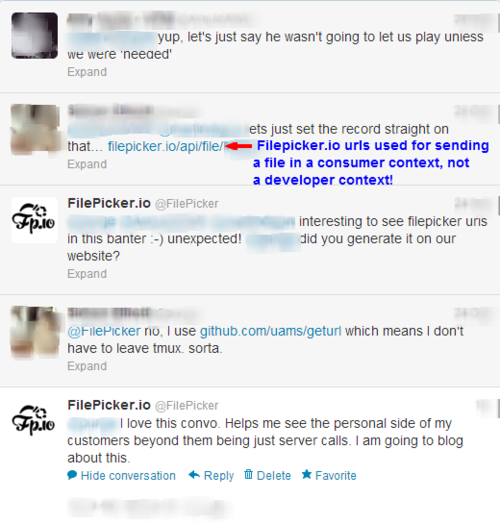 Who would have thought that the value of Filepicker.io for him was that he could share files without leaving tmux? When doing customer development it’s valuable to focus on the non-work related persona of the customer. Often we focus almost exclusively on the professional persona of the customer while ignoring what the customer likes, does, loves outside the product-market context of your interaction. So how do you resolve this blind spot? a. Walk me through a day in your life? b. What are your interests outside work? c.	What do you do in your free time? d.	Do you work alone or with others? e.	How do your personal interests influence your professional interests and vice-versa? At Filepicker.io, as a company focused on helping developers we invested time in learning the professional persona of our customers. But as this twitter interaction taught us we should learn about the non-professional persona of the customer as well.